Although mini in size, this item has proved to offer large organizational benefits. The dividers come in an colorful assortment of five dividers. The double-sided, easy-load slant pockets allow for extra storage of documents and media. Each set includes write-on tab labels to help identify the sections within the binder. The assortment of colors and storage options allows individuals to customize their binders to organize documents as they prefer. 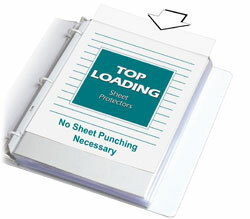 The versatile dividers are 7-hole punched, allowing them to fit in standard 3-ring 5 1/2 x 8 1/2, 6 x 9 or 8 1/2 x 11 binders. On-the-go organization is easy with C-Line's document storage additions! Note: If using a day planner, please check the actual product dimensions and hole punch configuration; does not work with all day planner systems.